Restore the 4th says, Call now! Sunset 702! Tweet at your Congressmember today to prevent a sneak vote for mass surveillance! In the House, surveillance hawks are trying to ram through a bill extending mass surveillance, without time for debate or amendment. If we can delay or defeat this vote, every day will make a huge difference in this fight. Section 702—the legal authority the NSA relies on to engage in this mass surveillance—theoretically expires in 12 days; the closer we get to that deadline, the more leverage we have to pass real reforms. The vote on this is likely to happen today, so there’s no time to make phone calls or send emails. Please tweet at your members of Congress using www.decidethefuture.org and urge them to vote NO on H. R. 4478. Many thanks to Restore the Fourth for providing this timely notice to their subscribers, and apologies for reposting it here, but we are a shoestring volunteer group. 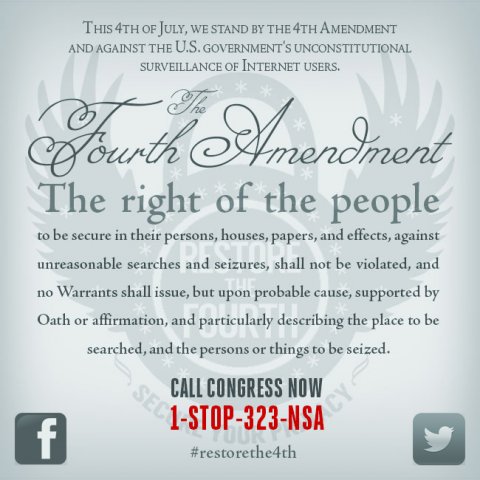 We encourage our readers to get involved with Restore the 4th , which works to protect us from overreaching, unconstitutional mass government surveillance. You are currently browsing the Get FISA Right blog archives for December, 2017.